BEST DELUXE RESTAURANTS IN KARLSBAD - KARLOVY VARY. FIRST CLASS AROUND THE WORLD: THE DELUXE TRAVEL MAGAZINE FOR THE EPICUREAN & DISTINCTIVE TRAVELLER. The most reputed restaurants in Karlsbad are located in the best hotels and sanatoriums: we advise you to enjoy, for instance, a fine lunch in hotels DVORAK, IMPERIAL or BRISTOL PALACE (beautiful panorama). For dinner, the must is of course the GRAND HOTEL PUPP. For a stylish quick bite, go to the extraordinary -and cheap- CAFE ELEFANT. 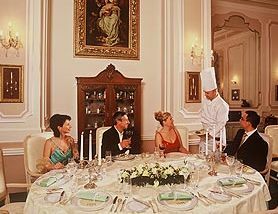 LA BELLE EPOQUE (GRAND HOTEL PUPP) (****) : Celebrated in the all Czech Republic, the dinning room of the GRAND HOTEL PUPP is a real splendor. Stylish waiters silently glide from a table to another, while a pianist bring a nostalgic musical ambiance to the huge baroque restaurant: that kind you just find in spa cities, where life goes under easy sail. Invention in matter of gastronomy doesn't go too fast neither: you will find in your precious Thun china plates the same specialities they served on the grand-opening ceremony of the palace ! If you hate French "Nouvelle Cuisine", LA BELLE EPOQUE is THE place for you. Quite expensive, but not ruinous : above all if you avoid the Dom Perignon, and order the interesting and tasty Moravian wines they sell for the price of mineral water in Paris ! 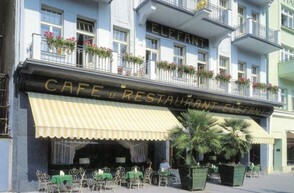 CAFE ELEFANT (***): The kind of landmark which excites the traveller, the CAFE ELEFANT has been for couple of centuries the favourite meeting place in Karlsbad. The main protagonists of the 1848 revolution even made this Viennese style "salon-de-the" (not British enough to be refered as a "tea-room"...) their headquarter. Regarded as a somehow national monument, the CAFE ELEFANT has been recently refurbished in its former splendour (just ignore the cheap, ugly chairs and the bad taste carpet...). A small guilded statue of an elephant welcomes you above the entrance door. Once you get inside, manage to find your way in the heavy smoke ! If somebody jumps on your back to catch your overcoat, don't be afraid: this is just the helpful waiter who wish to hang it for you on the hat stand. May be the place will be full: in that case, it is considered natural to share a table with someone you never met before. A beautiful Czech lady, for instance ! Sandwiches and cakes are delicious. Coffee is a great Viennese moka. This is so inexpensive you will leave a generous tip to the friendly staff. Just DO not miss it !